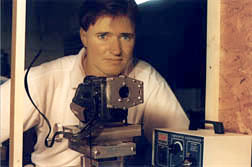 Bryan Greer is a mechanical and optical engineer living in Worthington, Ohio. He has been a telescope maker since his high school years in the '70s. He enjoys fabricating optics in his basement workshop, and trying to perfect the Newtonian telescope. Back to Telescope Optics Topics.